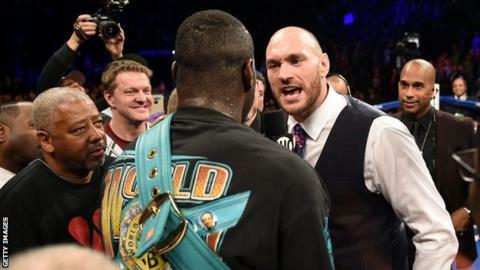 Undefeated WBC champion Deontay Wilder has told Tyson Fury he is prepared to fight him in England if the Briton wins his rematch with Wladimir Klitschko. Fury, 27, upset Klitschko to claim the WBA, IBF and WBO titles in November and is due to take on the Ukrainian in a rematch in May or June. American Wilder, unbeaten in 36 fights, has offered Tyson the chance to unify their heavyweight belts. "If he wins, I'm willing to go there to take the titles," Wilder said. Wilder retained his WBC heavyweight title in Brooklyn this month by beating Artur Szpilka, and was confronted by Fury in the ring. "When he got in the ring I told him I'll come to his backyard - and I mean that," added Wilder. "When my legacy's over and done, I want to be labelled as someone who went behind enemy lines, fought everybody and had great exciting fights every time."